In the deep, unclean depths of the Italian Thrash Metal scene, ULTRA-VIOLENCE claws its way through the mire and refuse, determined to survive. They have succeeded, and they’ve got a serious chip on their shoulder for not being taken in by the other bands they share a scene with. That’s a lesson for how supervillains are created, guys! Even their artwork reflects their brutish nature with images of the infamous Clockwork Orange gang and the Ludovico Technique on all their album covers. Their third album “Operation Misdirection” is a collection of eight festering wounds past the point of treatable. ULTRA-VIOLENCE is ultra-heavy. “Cadaver Decomposition Island” is straight-nitro-charged energy powering a twenty-cylinder motor. The music video depicting thousands of wriggling maggots slowly stripping the flesh of a cadaver in the world’s most skin-crawling feeding frenzy. The image that ULTRA-VIOLENCE paints in the first few songs are cynic, acidic and brimming with contempt. At the same time, they try to inject gentle acoustic interludes to round off some of the harsher songs. This is all intentional according to lead vocalist Loris Castiglia in an interview with Distorted Sound Magazine. Castiglia said that since his English has improved he has been able to write better lyrics for “Operation Misdirection” without losing their meaning in the translation, and he also aimed to create an album that has more instrumental transitions and not having the sound being at Eleven for the whole album. To Castiglia, this symbolizes the transition of life to death, a corpse being eaten and picked clean by animals, fungus and insects, and then decomposed by the Earth. “The Acrobat” comes screaming in, leaving a trail of fire in it’s wake as it blazes past with classic Speed Metal riffs and old school Thrash backing vocals. There is even a cover of classic 80s song “Money for Nothing” perfectly executed and made their own. 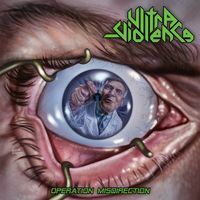 ULTRA-VIOLENCE has raging energy and seething hate to spew, but rest assured, there is plenty to go around.